Many time Windows right click menu is crowded with items which we may not use all the time and many times we might have wished to add more items and commands to the right click menu. Here is a small utility which helps you to customize the Windows right click menu- FileMenu Tools. FileMenu Tools lets customize the context menu of the Windows Explorer. 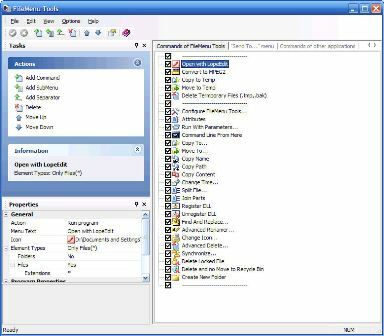 The application add some build-in utilities in order to do operations over files and folders; add customized commands which lets you to run external applications as well. Add build-in utilities in order to do operations over files and folders. Configure the “Send to” sub menu. Delete files locked by other programs. Split and join large files. Delete files permanently without Recycle Bin. Change file date and time. These are some of the features of FileMenu. FileMenu is a freeware and is supported on Windows 98/Me/2000/XP/Vista. FileMenu is a pretty handy tool for customizing the default right click menu which sometimes get cluttered with lot of application menu. Looks like a great utility. I really get annoyed when software programs keep adding their own menus to the context this will definitely help me get rid of that. Stumbled. It wont eat up your memory, a small utility. Nirmal, this is fabulous! I love this tool! Thanks a lot! Seems to be pretty nice tool !!! Thanks, Nirmal. I’ve been looking for something like this. Off to download it now. Nice utility, generally my right click meny contained so many useless options. Just what i was looking for. Thumbs up! Looks like a good one will try it for sure .